Home Costs > How Much Does a Fire Hydrant Cost? How Much Does a Fire Hydrant Cost? A fire hydrant is a very recognizable pipe connected to the city’s underground water supply found alongside the road. This fire hydrant will assist emergency crews in putting out fires by supplying water to the hoses in a fire truck. A new fire hydrant can cost anywhere between $1,000 to $2,500, depending on the make and model, size and where it’s purchased. This will not include the installation. If the installation is required, it is going to depend on the location, whether or not there is an existing hydrant that is being replaced, the contractor, and distance from the city’s utilities. A fire hydrant with professional installation can cost anywhere from $3,000 to $7,000 on average. The average replacement can cost about $2,500 to $3,500 for parts and labor. 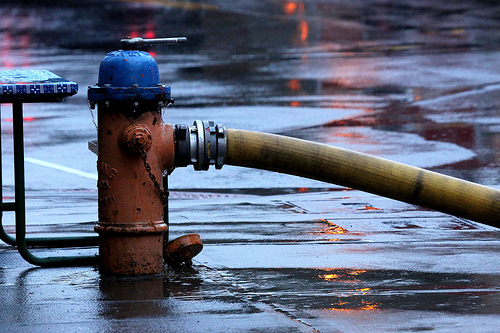 According to this NasDaq.com article, the average cost to replace a fire hydrant is $1,000 in Northern California. FireHydrant.org states that a good quality hydrant should cost around $1,000, but by the time installation and labor is factored in, the costs could increase to as much as $6,500. On this BiggerPockets.com forum thread, members had asked about what a fire hydrant would cost. According to the responses, it should cost $5,000 to $6,000 installed. The fire hydrant is made up of a few unique components: the relief valve, cast iron dirt cap, and breaking ring. The relief valve provides temporary relief of the water system while being used. A cast iron dirt cap will be installed on the top so no debris enters the unit, which causes it to clog. The breaking ring, also known as the traffic flange, allows the hydrant to break off when hit by an object. Underneath, there is a drain valve beneath the ground. After the fire hydrant is used, this drain valve allows the hydrant to completely drain to ensure that no water is left behind. If water were to stay it could freeze in the winter and cause pipes to burst. Annual maintenance for a city can run $5 to $25 per year, per hydrant. Digging up an existing fire hydrant can cost upwards of $2,500 to $4,000. If you want to have a hydrant near your home, the city may require you pay for a connection to the water and sewer, which can reach into the thousands. This will depend on the distance from the pipes that need to connect to the hydrant. Many people think that fire hydrants are 100% the city’s responsibility; however, if you were in a car accident and hit a fire hydrant, you are legally responsible for the cost of replacing or fixing that unit. Be sure to call your car insurance company to see if your car damage is covered and what steps you need to take to pay for the hydrant damages. Do not just drive away. This could cost you more in fines in the long run, especially if someone else saw you in action and reported it to the authorities. If buying the fire hydrant for a neighborhood, consider purchasing a unit that has a pressure activated rubber facing drain valve. This causes a positive closure of all valves during the usage of the hydrant so no unnecessary water leaks out anywhere. Be sure to buy a unit that has a tamper-resistant hose nozzle pumper adapter. Unfortunately, there are people who like to deface property, and this will protect one of the most important areas on your hydrant, which is where the fire hose will go in case of an emergency. If you want a fire hydrant close to your home, check with the city to see what their codes are. You may be entitled to get one and the city will pay the bill.